TORONTO (Apr. 3) — No team has won the Stanley Cup after losing more than 14 games in regulation time on home ice during the regular season. The Toronto Maple Leafs, therefore, would break new ground by ending their 52–year championship drought this spring, having dropped their 15th match at Scotiabank Arena on Tuesday night. The 4–1 victory by Carolina in an otherwise–meaningless game for the Blue and White saw Toronto’s home record fall to 23–15–12. Tampa Bay closes out the Maple Leafs’ schedule on Bay St. tomorrow night; the Lightning, by prevailing, would become only the second National Hockey League club to win more than 60 games in a season, joining the 1995–96 Detroit Red Wings (62–13–7). In 2011–12 and 2013–14, the Los Angeles Kings lost 14 games during the regular season at Staples Center and won the Stanley Cup each spring. So, the Leafs need to make history as the flowers bloom this year. In their last championship season (1966–67), the Leafs played a 70–game schedule as part of the six–team NHL and compiled a 21–8–6 record in 35 matches at Maple Leaf Gardens. That club, however, fared poorly on the road with an 11–19–5 mark. The current Leafs, by comparison, are tied with the 2003–04 club for most victories away from home in one season: 23. Only Tampa Bay (28), Washington and Calgary (24) have been more successful on the road. 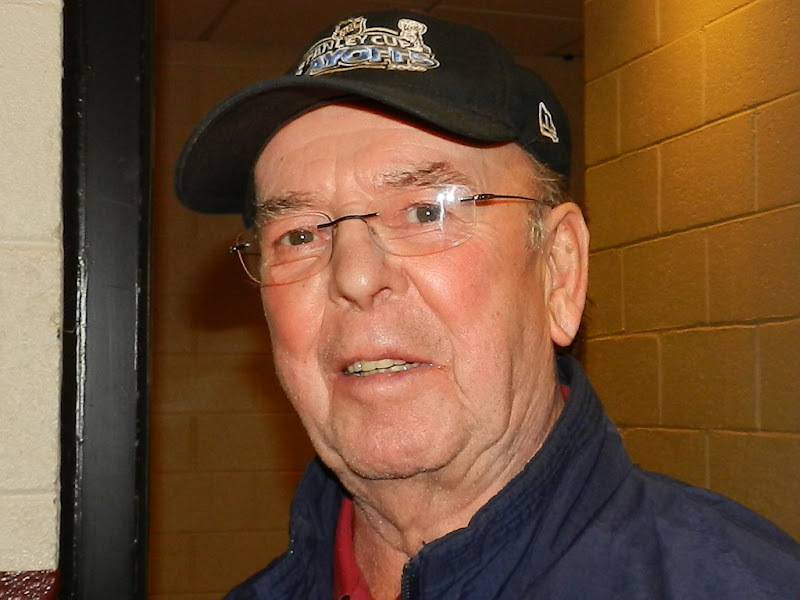 Toronto can establish a new franchise record by winning its season finale, at Montreal, on Saturday night in Bob Cole’s final telecast on Hockey Night In Canada. The broadcasting legend, now 85, will end a 50–year run on national TV that began with Game 6 of the Stanley Cup semifinals on Apr. 24, 1969 at the Boston Garden. The late, great Jean Beliveau scored in overtime on Gerry Cheevers to eliminate the Bruins and send the Canadiens on to the Cup final round against the St. Louis Blues. Earlier this week, Cole sat down with Ian Hanomansing, host of The National on CBC, and reflected on his Hall–of–Fame career. You can watch the interview here… http://bit.ly/2CP64Wk. I’m rather honored that Cole’s profile image (below) on Wikipedia was taken by me at Gila River Arena in Glendale AZ during the 2012 Western Conference final between the Arizona (then–Phoenix) Coyotes and the L.A. Kings. In many–a–spring, the NHL regular season has proven to be a mirage. Lower–ranked teams come out of nowhere, get hot at the right time, and belie their results between October and April. A good, recent example is the 2012 Los Angeles club (40–27–15, 95 points) that required a 9–2–3 run at the end of the schedule to become the 12th and final playoff seed in the Western Conference, clinching in its second–last game. The Kings then romped to a 16–4 record in 20 post–season matches — winning the first two on the road in all four series (against Vancouver, St. Louis, Phoenix and New Jersey) — to capture a surprise NHL title; their first. And, it begs the question: Can the road–savvy Maple Leafs become similarly efficient in the playoffs this spring? To advance beyond the Atlantic Division and into the Stanley Cup semifinals, the Leafs will have to win at least one road game in Boston and (likely) Tampa Bay. Which is hardly beyond the realm. The Lightning, in fact, may encounter more of a challenge in the opening round than many anticipate. By cake–walking to one of the most–prolific regular seasons of all time, T–Bay hasn’t been involved in a game of importance since November. The Lightning will face the No. 2 wild–card team in the Division semifinal — almost–surely one of Carolina, Columbus or Montreal (today, it would be the Blue Jackets). Though none of the aforementioned should have a prayer, what if suddenly needing to win games is foreign to Tampa Bay? The Hurricanes, Blue Jackets or Canadiens will come in after playing for their lives over the final month of the schedule. Could they ride that competitive edge to one of the biggest upsets in Stanley Cup history? This scenario happened in the spring of 2010. Washington (54–15–13) won the Presidents’ Trophy by eight points (121–113) over San Jose and the Southeast Division title by a whopping 38 points over the old Atlanta Thrashers. Then came the first round of the playoffs against a much–inferior Montreal team (39–33–10, 88 points) that qualified by a single point over the New York Rangers. The Capitals needed an overtime win in Game 2 to avoid losing both opening matches at home. Then, after building a 3–1 series lead, Washington couldn’t beat Habs goalie Jaroslav Halak. The Canadiens roared back to win the final three games of the series — allowing only three goals — and eliminated Washington with a 2–1 victory at the Verizon Center. Just for fun, let’s look at the 2019 Eastern playoff match–ups as they are today: TAMPA BAY vs. Columbus / WASHINGTON vs. Carolina / BOSTON vs. Toronto / NEW YORK ISLANDERS vs. Pittsburgh (home team in capital letters). What if Columbus shocked the Lightning; Washington beat Carolina; the Leafs upset Boston and the Islanders defeated Pittsburgh? 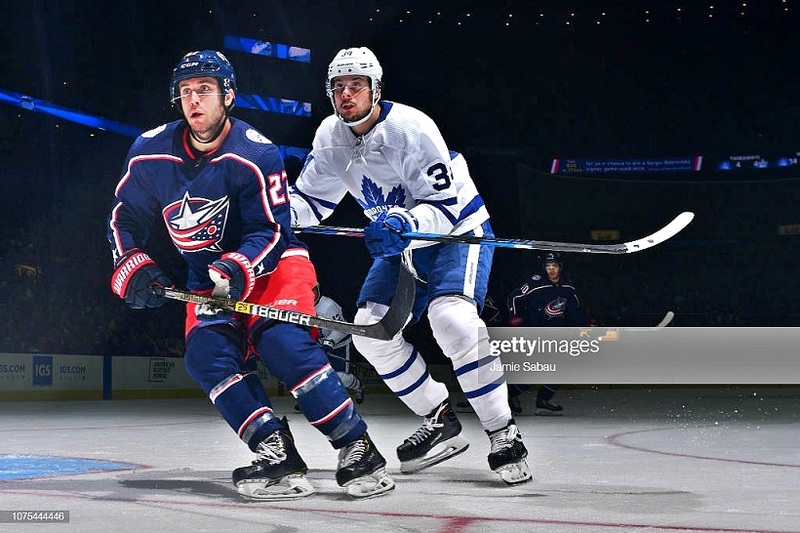 Second–round match–ups would be WASHINGTON vs. New York Islanders and TORONTO vs. Columbus; the Maple Leafs with home–ice advantage over the Blue Jackets. Strange stuff, indeed, but not without precedent. CAN YOU IMAGINE THE MAPLE LEAFS AND COLUMBUS IN THE SECOND ROUND OF THE PLAYOFFS? KYLE’S DUBIOUS CALL: The activity–of–the–week in Leafs Nation is dumping on back–up goalie Garret Sparks, who looked uncomfortable, shall we say, in losses to Ottawa and Carolina. But, fans are targeting the wrong culprit. Sparks proved to be a very good American Hockey League netminder, backstopping the Toronto Marlies to the Calder Cup title last spring. There is, however, an enormous gap between the NHL and its top minor league. Which was clearly ignored by Kyle Dubas upon being elevated from Marlies to Leafs general manager. Rather that sticking with incumbent Curtis McElhinney, as per the legitimate desire of coach Mike Babcock, Dubas pulled rank and “rewarded” Sparks with the No. 2 role. To suggest the move backfired may be an understatement. McElhinney has won 19 games with Carolina this season after being claimed, last October, when the Leafs placed him on waivers. 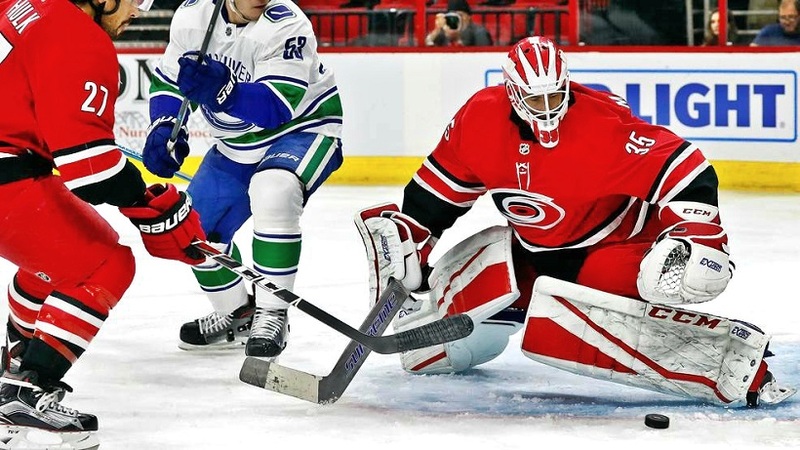 Hurricanes coach Rod Brind’Amour has felt comfortable in starting McElhinney 32 times. Sparks, by comparison, has made 20 starts for the Leafs and compiled an 8–9–1 record with the No. 6 team in the NHL overall standings. Which is largely a reason why Toronto can no–longer equal its franchise–best total of 105 points from a year ago (103 is the maximum). Few NHL observers figured the Leafs would decline in any realm this season after adding John Tavares to an already talent–laden roster. McElhinney has prevailed in 59 percent of starts; Sparks in 40 percent. By that calculation, four additional wins right now would have the Leafs at 107 points… two ahead of Boston in the Atlantic playoff race. It’s one way of viewing a short–sighted and costly decision by the club’s rookie GM. SOUNDING GOOD: While the Toronto Blue Jays are feverishly ridding themselves of every identifiable player, fans should at least enjoy listening to the club on radio this season. 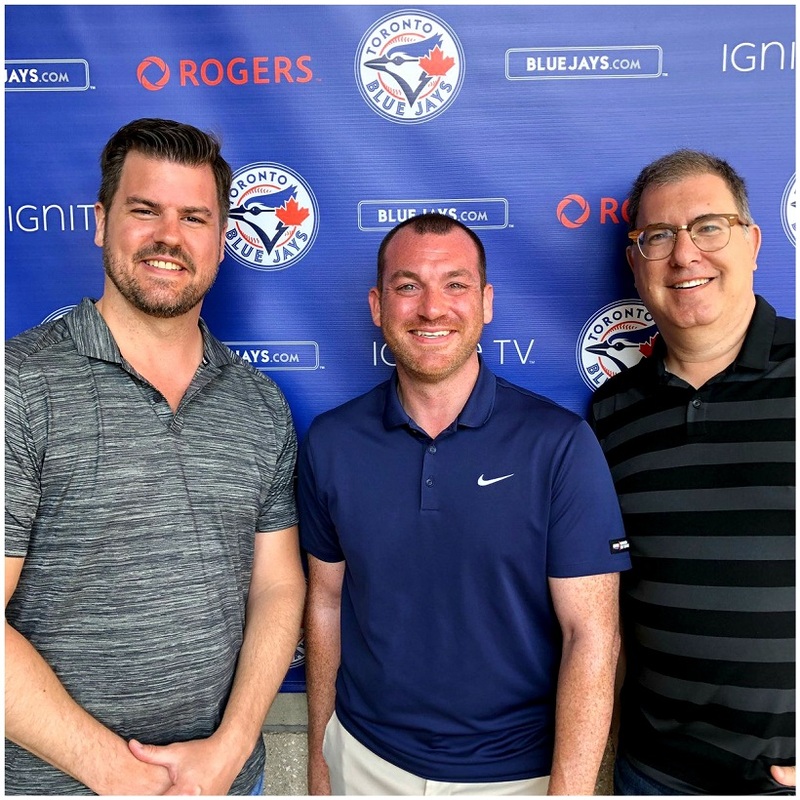 After a year of flux in which Jerry Howarth unexpectedly retired and Joe Siddall moved from radio to TV to replace the departed Gregg Zaun, the Jays have put together a superb trio for Sportsnet–590. Ben Wagner goes into his second season as primary play–caller, after being elevated from the Blue Jays Triple–A affiliate in Buffalo. The 38–year–old native of New Paris, Indiana should easily follow Howarth and the late Tom Cheek on a lengthy Major League ride. He’s an exceptional broadcaster with the intonation and knowledge required to call 162 games between late–March and late–September. Wagner is joined in the booth by my old FAN–590 colleague Mike Wilner, now 49. For years, Mike was perfectly polarizing in his execution of the Blue Jays pre and post–game radio shows — fervently defending the club in all situations, warranted or otherwise. He is now wonderfully–positioned as the No. 2 voice in the broadcast booth alongside Wagner. Never lacking for baseball knowledge, Mike has evolved into a very good play–caller, spelling Wagner in the third, fourth seventh and eighth innings of games. I’m happy for him. And, Rogers made an excellent call in hiring former TSN–1050 baseball reporter (later, mid–day host) Scott MacArthur to handle Wilner’s former duties. Scott is gung–ho about his new position, as he should be. Let’s hope the hysteria of call–in radio with a losing (or re–building) team doesn’t cost MacArthur his sanity. He’s a good broadcaster and an even–better guy. LEFT–TO–RIGHT: SCOTT MacARTHUR, BEN WAGNER AND MIKE WILNER. SOUNDING GOOD ON SPORTSNET–590. Howard your prose brought to memory former Leaf Nik Borschevsky who decided to impersonate a young King David when he slayed the Goliath-like Red Wings way back in 1993. Back in ’93 nobody gave the Leafs a shot against the Red Wings Dynamo. I’m still not sure how they did it, but I remember watching every game, my eyes glued to the TV and my kiester on the edge of my seat. At some point in time, the puck has to continuously bounce in favor of Toronto. Hopefully this is the year. So people have been saying, Jon, for more than half-a-century.